Based in Batesville, Arkansas, Pro Se Productions has become a leader on the cutting edge of New Pulp Fiction in a very short time. Pulp Fiction, known by many names and identified as being action/adventure, fast paced, hero versus villain, over the top characters and tight, yet extravagant plots, is experiencing a resurgence like never before. And Pro Se Press, publishing New Pulp since August, 2011, is a major part of the revival, one of the reasons that New Pulp is growing by leaps and bounds! Pro Se is the place to find Super Heroes, Explorers, Fairies, Werewolves, Men's Men, and Femme Fatales. Specializing primarily in prose books, anthologies, and magazines, Pro Se has made a commitment to 'Put the Monthly Back into Pulp' and continues to do that successfully, producing at least one New Pulp work every month! Pro Se is an innovator in New Pulp, continually refining its presentation and product and working on exciting new veins of New Pulp to bring to readers and fans of all ages everywhere! A world where heroes and villains existed since the day the market crashed and the world almost collapsed. Common people granted great powers and awesome responsibility. A world where one of them knew all the secrets, good and bad, and put them down in a book. A world where that man and that manuscript disappeared. Until now. 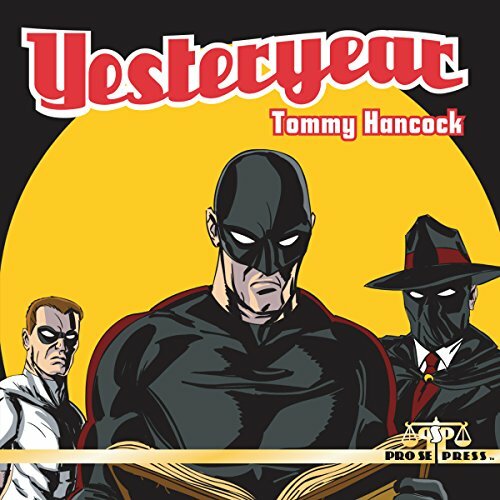 Author Tommy Hancock’s YESTERYEAR is the first book in an epic series chronicling the adventures of heroes and villains, both in the heroic age of the 1920s-1950s and in the modern day. Centered around a missing manuscript that might hold information that could literally change history and even mean the end of the world, Yesteryear alternates between a fast paced modern storyline about the man who ends up with the legendary book and excerpts from the mythic tome itself. Marvel at pulp-like adventures of glory and adrenaline and become engrossed in the humanity and horror of being a hero. Yesteryear by Tommy Hancock. Sometimes the greatest mystery of tomorrow happened yesterday! This dynamic New Pulp audio book is also available on Audible and Itunes. YESTERYEAR is available at Amazon and www.prose-press.com. For more information on this title, interviews with the author, or digital eBook copies to review this book, contact Pro Se Productions’ Director of Corporate Operations, Kristi King-Morgan at directorofcorporateoperations@prose-press.com. Check out Radio Archives and the fantastic audio books, classic radio collections, and the fantastic variety of classic Pulp eBooks they offer at www.RadioArchives.com. To learn more about Pro Se Productions, go to www.prose-press.com. Like Pro Se on Facebook at www.facebook.com/ProSeProductions. FOR IMMEDIATE RELEASE LAZARUS GRAY RETURNS TO AUDIO! VOLUME TWO-DIE GLOCKE NOW AVAILABLE! FOR IMMEDIATE RELEASE FROM FANTASTIC ART RISE GREAT STORIES-‘WRITE TO THE COVER VOLUME TWO’ DEBUTS!